The new PR02 motor series is characterized by a new design wherein the motors and additional components are integrated in a slim housing. Options can be installed such as a magnetic spring “MagSpring”, a torque sensor, and a force sensor. A properly sized MagSpring ensures that the tooling and motors moving mass are passively compensated for, preventing the axis from falling in event of a power loss. The torque and force sensors enable precise, reproducible, and recordable capping processes often required in pharmaceutical or medical industries. Users also benefit from the PR02’s short length and the hygienic easy-to-clean surfaces. Sensitive assembly operations such as a screwing application with tight tolerances in the millimeter range require a complex external measuring technique. 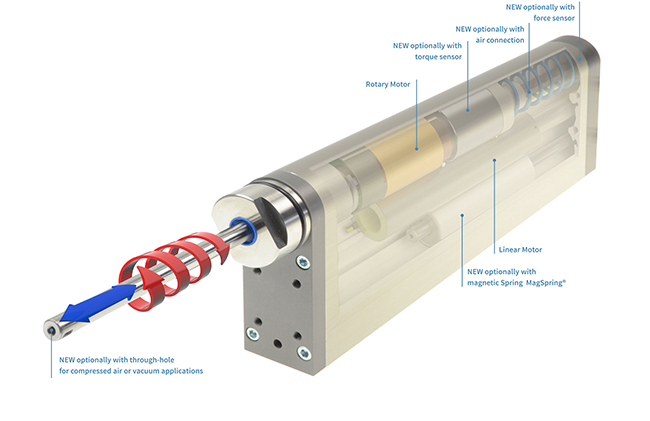 The new LinMot PR02 linear rotary motors already include everything needed to perform a demanding sealing task without the use of these external complex devices. During operation, the PR02 motors measure all important variables including: linear position, angle of rotation, feed force, and torque while controlling them precisely for the respective application. In cases where poorly fitting closures or damaged threads interfere with assembly, both servo motors and their respective sensors redundantly detect the abnormality. Demanding and sensitive assembly tasks are carried out completely without external measuring technology. The innovative PR02 delivers all necessary data packages for networked production in the sense of “Industry 4.0”. With the help of the drive parameters and optional additional sensors, detailed information, such as the vertical position, press force or impact force, closing angle and torque are available. In many cases, this information simplifies or eliminates the need for costly downstream inspections. The user has full control over the process quality and can detect deviations at an early stage while also ensuring traceability of every single product in the entire production chain.